Filter Sand and Gravel are naturally occurring, river washed, glacial deposit products. Their excellent chemical properties – high in silica content and low in soluble calcium, magnesium and iron compounds – meet AWWA-Bl00-96 specifications. Precision sizing and uniform grading to close limits meet the rigid specifications of professional engineers throughout the world. For over 80 years our Filter Sand and Gravel have been satisfying the requirements of industrial, municipal and residential users. These products have been specified and used nationally and internationally because of their high quality, desirable chemical properties, color, and wide range of precision sizing. Processing and regular analysis of production are supervised by registered professional engineers. Our Filter Sand is graded specifically for water filtration plants. It can be used in municipal, industrial or residential applications for sediment filtration. Our uncrushed Gravel has a highly spherical shape that promotes good flow and even distribution in support beds. Gravel is low in soluble impurities and it will maintain the quality of the treated water, especially in softeners. Three inch layers are recommended in graded support beds. * All physical properties and conditions for operation are the same for gravel with the exception of mesh size, effective size and uniformity coefficient. Backwash flow rate: 15-20 gpm/sq. 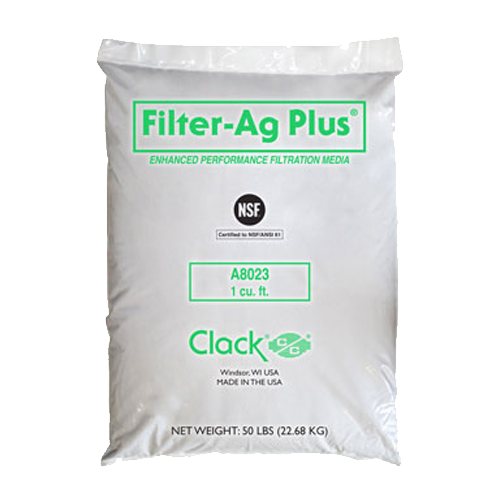 ft.
Filter Sand and Gravel are more fine media from Clack Corporation.